A clean natural paper printed logo mockup psd shared by mockups-design. There are two mockups in zip archive, one with single paper and other one with multiple paper that can be customized by changing colors. Easily place your logo design, typography, logotype on smart object and create beautiful realistic outcome of your design. 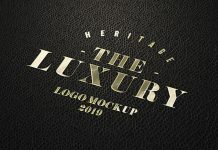 For more high quality free logo mockups check out our branding section. Grab the freebie!